Julie Caves uses the compositional potential of colour to evoke a moment of understanding. She uses painting to investigate colour: colour as an idea, as a system whose organisation is not perfect, as a mystery, as science, the seduction of colour, the acknowledged and the hidden meanings of colours, and colour relationships. We understand colour at a subconscious level and it is part of our biology to react to colour. She thinks you can investigate the world with art as well as with science. The resulting paintings use colour to communicate directly, to delight and intrigue. 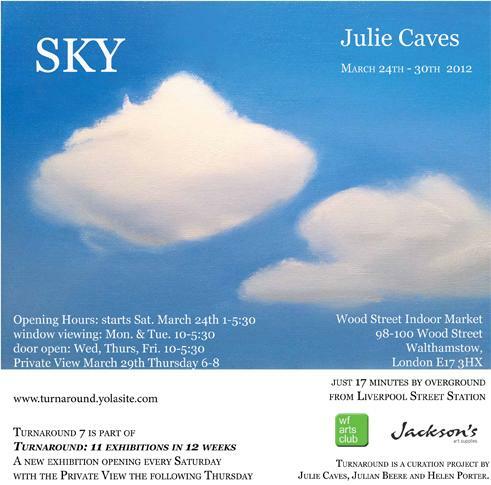 For these paintings for the SKY series she has used a variety of materials: some are painted in oils and some in acrylics, some are on canvas and some are on wood panel. 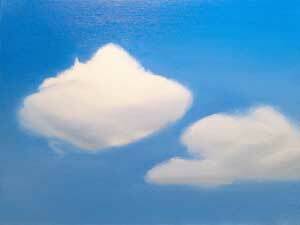 She has looked at a lot of skies to make these portraits of the sky. Clear skies where you notice the change in the colour and intensity as you move from the zenith to the horizon, sunsets on heavy clouds, drifting, wispy clouds, little puffy clouds and piles of meringue.